Foxes are one of my favorite animals, they're quick, smart and have such delightfully expressive faces. I also like to think there's a little bit of a George Clooney attitude in every fox, you'll know what I mean if you've seen Fantastic Mr. Fox. If you haven't, Netflix it immediately. When Heidi of Dooley Noted Style included one of Kari Herer's photographs in a post last week I made a purchase faster than you can say Fantastic Mr. Fox. Of course I'll be sharing! But that requires making a decision first... on frames and where to hand them! Thank you Janna! 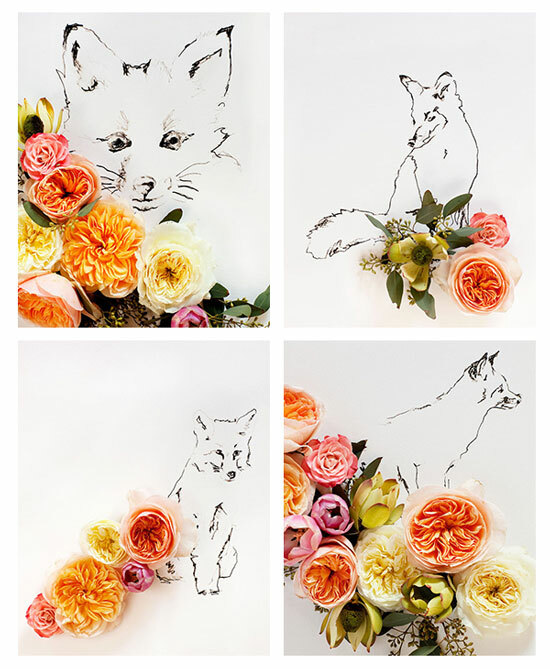 I've been keeping an eye out for cute fox artwork for a while and Kari's combines two of my favorite things, foxes and lovely flowers.